Much-anticipated war flick “The Battleship Island,” starring Song Joong-ki and others in a star-studded cast, was unveiled to press Wednesday at CGV Yongsan. 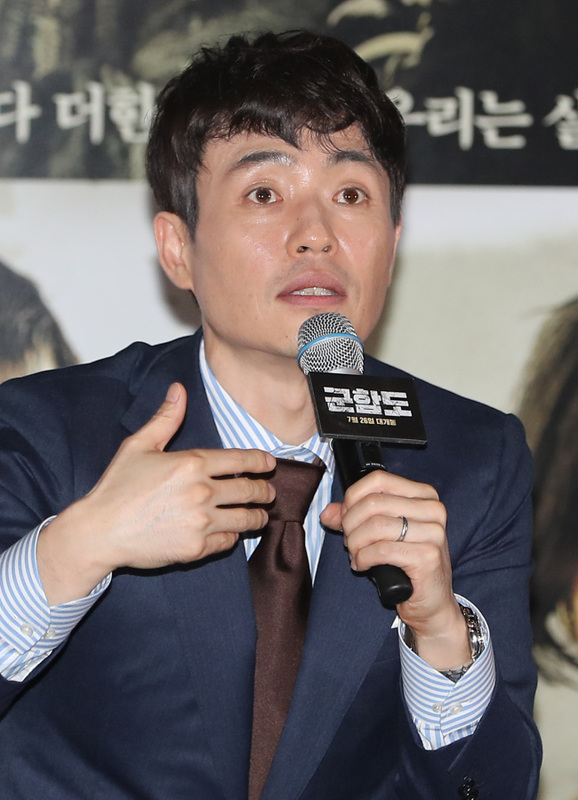 Director Ryoo Seung-wan said he had always wanted to make an escape thriller. “Escaping can be interpreted as an attempt to deal with the past,” Ryoo told reporters following the press screening. The war flick is set on Japan’s Hashima Island, where Koreans were taken captive as slave laborers in mines during the Japanese colonization of Korea. Actor Song plays a soldier in the Korean Liberation Army who smuggles himself onto the island on a rescue mission. Though the heroic character is similar to the one Song played in 2016’s smash-hit TV drama “Descendants of the Sun,” director Ryoo shot “Battleship Island” before the series aired. The film has spiraled into a major blockbuster set to hit summer box offices. Director Ryoo, however, had no intention of exploiting a painful historical past for ticket sales.